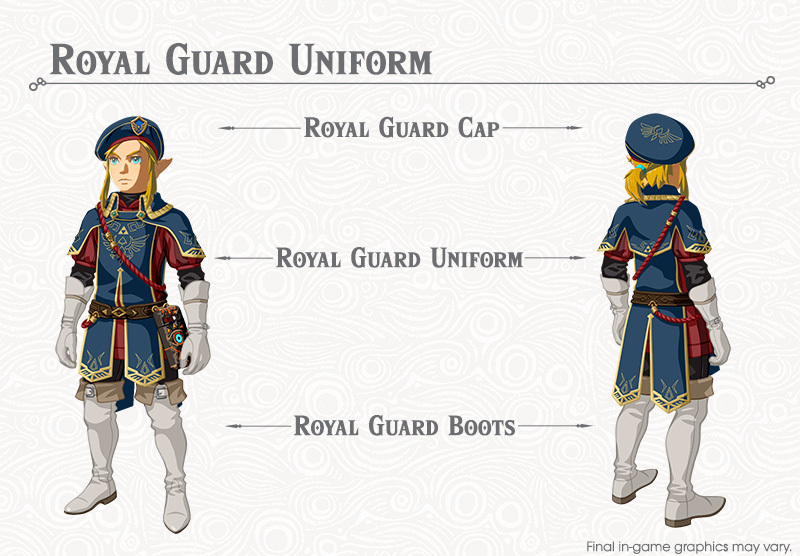 Royal Guard Uniform is an armor set in Zelda Breath of The Wild. It is an ornate armor worn by the guards of Castle Hyrule, and it was added to the game in the Champions’ Ballad DLC. It consists of three pieces, all of which are hidden in the castle itself. The latest edition of Rumor Mill will nudge you towards them, but they can still be hard to find. In this guide, we’re going to show you the locations of all three parts of the Zelda BoTW Royal Guard’s Armor. If you go to the Riverside Stable, you’ll find the latest issue of the Rumor Mill magazine on a table inside. In it, you’ll find info about the armor set – all three pieces are in Hyrule Castle, one in the Dining Room, one in the Guards’ Chamber, one on the second floor. The uniform is in a small room near the Dining Room, at the place you already visited when you went looking for the Royal Guards’ Sword. The cap is near the top of the castle, in the Sanctum. A good way to get there is to use the nearby waterfalls, provided you have the ability to swim upstream. You’ll almost certainly need the ability to propel yourself into the air. The boots can be found in the Guards’ Chamber. Once you’re there, look for a platform on one of the walls, high above the floor. It’s near the broken staircase, and there are some explosive barrels on it. You can either climb up there, get it down using Magnesis, or shoot it with an arrow.